First of all, lavender sneakers sound AWESOME, and I think I might want a pair myself! When I think of wearing sneakers in a “cool outfit” sort of way instead of an “I’m going to do some jogging” way, I instantly think about Björk’s sneaker-with-dresses phase. She somehow managed to make footwear that’s considered sporty into something super stylish. It still inspires me to this day. Left to right: Björk, Rita Ora, Rihanna. In the pic above, Björk coordinates the color of her sneakers with her outfit. Rita Ora does the same kind of thing in the following photo, which answers your question about wearing your sneakers with matching lavenders, purples, or other pastel shades! If you find a dress or top that has a pattern with some lavender in it, it will most likely work. However, as someone who is a fan of dressing in one solid color, I think it would look amazing if you wore pastel purp from head to toe. An above-the-knee skirt or a dress with a defined silhouette would look great with the sneakers, too. I also LOVE the idea of you wearing them with something flashy, like this sequined lavender dress. How sick would that look accessorized with these glitter shades?! Left to right: Silver vegan leather mini skirt, $24.50, Lulu’s; A-line dress, $31, ASOS; stretch ivory dress, $44, Lulu’s. Hi, Rachel! Welcome, and thank you for speaking DIRECTLY TO MY SOUL. I just put on my favorite jumpsuit to answer this question! Glam rock is a treasure chest of razzle-dazzle and my personal favorite style era. Frankly, I’m overwhelmed trying to approach this Q. My heart is pounding out of my chest with excitement for the infinite options in how to achieve this look! In order to give you the glam guidance you deserve, I’ll break the look down in a few optional steps that you could mix and match. Glam is so maximal that YES, you COULD wear those two different leopard prints together, and the suede with the sequins, and the flared pants with the lace top! Consider this a head-to-toe primer for a ton of different looks, though we’re only scratching the glittery surface, of course. Glam shoes: Let’s take a look at BONKERS SHOES. Platforms look like cakes for your steppers but they can be hard to walk in. If you are trying to pull off a glam look and actually, like, leave your house and walk more than a block, my recommendation is to look for more practical styles in wilder patterns. Bell-bottoms and bell sleeves: DING-DONG. Is that the doorbell? Nah, it’s you, cos your whole look is saved by the bell. Sorry for mixing metaphors; NOT sorry for these adorable bell-bottoms and bell sleeve pieces. The bell silhouette will immediately make you look like you walked straight out of the Whiskey a Go Go in the ’70s and into the present day, which is what we’re going for! Classic bell-bottoms with a very ’70’s button-up waist will look like you got them from a vintage shop. Lace-up flies also feel quintessential glam and would make a good alternative. This top from Zara is an absolute jaw-dropper! For all those about to spread their arms and take flight, may I recommend some wings of sequin? Patterns and textures: No rules here. Wear animal print with leather. Welcome flame stitch into your life. Fake fur, metallic, sequins, and suede are all invited. Here are some gorgeously glam pieces to mix and match to the max. A suede skirt is the ideal evergreen piece for your closet, since it can go with anything. Check out this vegan one, both colors would completely rock. A metallic skirt will make anything it touches turn to solid glam. Enough said. Pairing flame stitch with funky shoes and a fur-collared coat is one of my favorite ways to dress. Check out this amazing star appliqué top that looks totally inspired by Bowie. There’s a lot to appreciate about a coat that is at once a walking blanket and a glamorous statement piece, like this long leopard style. Plus, any coat with a glam edge will turn any outfit you have into a party-time look. As for makeup looks, this is where you raid the cheapo section of the drugstore beauty aisle and get every gold, silver, pink, and blue shimmery eye shadow or glitter lip pencil that catches your eye. You could take a cue from the British glam rock outrageousness of Wizzard. 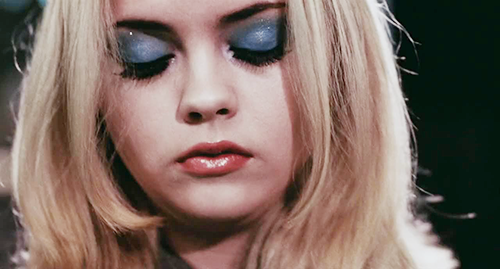 My favorite look that seems glam rock to me, but is actually from the ’90s film Buffalo ’66, is this baby blue eye shadow paired with a hot magenta lip on Christina Ricci. As a fellow style queen with thick thighs that save lives, I know your conundrum very, very well. Why, even just a few days ago, I put on some thigh-highs that my mom had given me and they immediately began rolling down my legs as I slow-motion screamed, “Noooooo!” So I feel you. I personally opt for a knee sock or a slightly over-the-knee sock so I can avoid the potential fuckery of the roll-down. I also love me a mock thigh-high or some suspender tights. But don’t let my laziness stop you from reaching for the stars. I have combed relentlessly through the sands of the internet, hoping to find the answer to your dilemma, and the one word that keeps popping up is Kix’ies. This brand looks like it was specifically created to stop that vicious roll-down. They are available in various designs and sizes, including for us gals with thicker gams. These thigh-highs are a different brand and have a good amount of decent reviews. And I know you didn’t want to wear anything that was too risqué, but you can always wear a garter belt under your clothes and high enough so it’s hidden. I like these, these, and these! Looking for style advice? HI, OVER HERE, WE WANT TO HELP. Send your question to [email protected], and please include your NAME/NICKNAME/INITIALS, AGE, and CITY/STATE/COUNTRY. thank you sooo much, Marie! Like Zoë I’d been looking for that perfect jean jacket as well, but I found it and I only take it off to wash it, now ahahah. Anyway it’s a second hand vintage Levi’s menswear jean jacket (the one with the red label inside) I found in a second hand shop for 30€.